The Yomiuri Giants lost their ninth straight game, falling 5-4 to the Orix Buffaloes in interleague play on Saturday. Takahiro Okada capped a four-run first inning off lefty Kazuto Taguchi with his 13th home run of the season, a three-run shot. “I haven’t been able to contribute that much recently, so this was satisfying,” Okada said after the Buffaloes won their sixth straight. “We knew it was not going to be easy against such a good opposing pitcher. Before the game, we spoke about us each being thorough and doing the things we had to. I got the chance because everybody else got the job done. 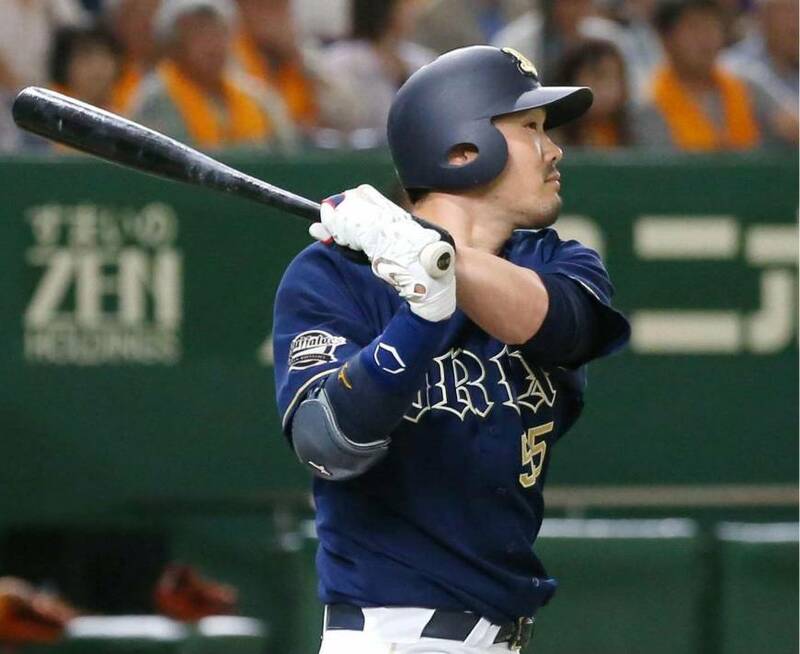 Hiroyuki Nakajima singled in an insurance run in the fifth that proved crucial after Shuichi Murata blasted a sixth-inning grand slam off Orix starter Takahiro Matsuba at Tokyo Dome. Murata’s third home run in three games made him the 29th player with 350 career homers in NPB. The slam, with no outs in the sixth, sent Matsuba (2-4) to the showers. The lefty gave up four runs on six hits and three walks. Gonzalez Germen took over for Matsuba and threw two scorless innings, while Yuta Kuroki and Yoshihisa Hirano worked a scoreless inning apiece to clinch the win. Taguchi (4-2) allowed five runs on eight hits. He struck out six, while issuing two walks and hitting a batter. The Giants had not lost nine in a row since 2006, and fell six games below .500 for the first time since Yoshinobu Takahashi took over as manager after the 2015 season. At Nagoya Dome, Tohoku Rakuten starter Manabu Mima (6-1) threw eight scoreless innings in a victory over Chunichi. “This is a relief. I was feeling a lot of pressure,” said Araki, a singles hitter whose career was based on speed and defense. It’s been very tough since the start of the season. Chunichi’s first-round draft pick out of Kumamoto Technical High School in 1995, Araki presented the Dragons with a middle infield conundrum. With veteran Kazuyoshi Tatsunami entrenched at second and another promising youngster, Hirokazu Ibata, vying for playing time as well, the Dragons moved Araki into the outfield for long spells. In 2002, Tatsunami was moved over to third base, leaving second to Araki and short to Ibata to form a double-play combination that would reach the Japan Series five times. Araki won a Golden Glove in six straight seasons starting from 2004. He won the Central League’s Best Nine Award at second base from 2004 to 2006. The previous Dragons to reach Japan’s iconic milestone were Morimichi Takagi, Kenichi Yazawa, Tatsunami, Motonobu Tanishige and Kazuhiro Wada. Ibata, now a coach with the Giants, said his former teammate’s accomplishment was a thrill. At Hiroshima’s Mazda Stadium, Xavier Batista, signed the day before from Hiroshima’s developmental roster, homered in his first at-bat, a pinch-hit, two-run shot in the sixth that lifted the Carp past Chiba Lotte. 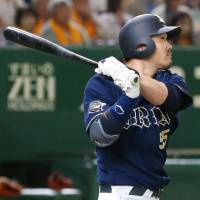 At Tokyo’s Jingu Stadium, Seibu’s Takeya Nakamura, Shogo Akiyama and Hideto Asamura all went deep off Shohei Tateyama (0-1). Yasuo Sano (3-1) held Tokyo Yakult to two runs over six innings, keeping the Swallows winless in five interleague games. At Yokohama Stadium, Alfredo Despaigne slugged his 16th home run, a three-run shot in the first off Yokohama starter Kentaro Taira (1-2) before Yuki Yanagita went deep in the fifth and ninth for Fukuoka SoftBank. The BayStars have lost four straight for the first time this year. At Koshien Stadium, Taichi Okazaki, playing in his 13th pro season, hit his first career home run, a two-run shot in the fourth that overturned a 2-1 deficit and lifted Hanshin past Hokkaido Nippon Ham.